In most tech companies, Product Marketing and Product Development/Engineering are managed separately. There is usually one VP over the Product Development function and another VP over the overall marketing function, which usually (but not always) includes both current product management/marketing and future product planning. While this is certainly an appropriate way to organize a software or hardware company, there is a great danger in one area when it comes to these separate operating “silos”: the planning of new products. I have a particularly strong opinion on this topic, with an extensive product planning, product management and marketing background and also having worked as a product development engineer earlier in my career (albeit in a non-tech business). With respect to current products, the silo approach isn’t much of an issue. The day-to-day activities of the marketing and engineering departments are very different, and can be managed separately quite successfully. It’s in the future product planning area that things can get messy. Product Management and Product Development organizations both have a key role to play here, if the company is to optimize the process of planning, developing and introducing the best new product possible. I often refer to the ideal product planning relationship as a “two-headed monster” between engineering and product management; it’s an accurate if inelegant term. The problems is that at every level, from the VP-level down to the engineering project managers and marketing product managers, the product management/marketing and engineering functions are often staffed by individuals with very different world views when compared to their direct counterparts in the other department. Inevitably, if care isn’t taken, these very different personality types and world views can lead to some pretty intense conflicts. I’ve been a soldier, captain and general and CEO in this war–and let me tell you, at times it isn’t pretty. The battlefield often is the company’s strategic plan, which can end up in a trampled mess. I have seen this battle play out all too often in the companies that I have worked for as an employee, as well as at many clients in my consulting practice. It sometimes gets so ugly it paralyzes a company, putting it at a severe disadvantage vs. competitors who have less conflict. Unfortunately, most CEOs that I meet are not all that tuned in to how damaging these conflicts can become. Often they will ignore or deny the problem, thinking it is a responsibility to be handled at the VP level. Another strategy that I have seen companies put in place is to extract the product planning function from the marketing department, and put it under engineering. This will often greatly reduce or eliminate the conflict, but in many ways its throwing the baby out with the bathwater. As I stated earlier, both marketing and engineering have a key role to play in product planning. This strategy effectively removes the voice of the customer, which is a key role that the marketing department should be playing in any successful software or tech company. As much as many product developers think it looks easy, they seldom have the skills or experience to accurately read markets or individual customers. Almost no one is great at everything; monitoring and reading markets and technical product development are two very different skill sets. Having differing mentalities involved in a positive way via participation by both departments generally leads to far better products in the end. Finally, if they happen to have come from one side of this battle or the other, CEOs sometimes “take sides”–predetermining the winner. The problem is there is never any real winner in this battle–and the only certain loser is the company and its shareholders. 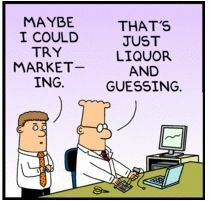 A CEO can choose to let marketing have the upper hand–and this may work out adequately in commodity products where there is very little engineering differentiation. In any other circumstance, results will likely be sub-optimal. Or he or she can let engineering win and dominate the planning process–which is a very common occurrence in early stage, technically-driven software and hardware companies. But this generally only works well for products made by engineers/developers and built for engineers/developers (the early days of Hewlett Packard are an example of this strategy working successfully). For every company that has used this approach successfully there are likely hundreds or thousands that failed in large part because of it. So what steps can a software or hardware CEO take to be on the lookout for this problem–and more importantly, what can they do to prevent it from developing? In addition to relationships, process can also be very important–make sure any process includes balance so that all voices are heard, but so that added weight is given to input provided by individuals in their area of expertise. Product planning ideally is collaborative, but it’s not a “one vote per man” democracy. Marketing/Engineering conflict over the product planning process is a common problem that is often overlooked by tech company CEOs. A certain amount of creative tension can exist between the two departments and be totally healthy. All too often, though, this tension turns into a bloody fight which is destructive to the company’s prospects. It is not “fait accompli”, however. It can be minimized and even prevented by a watchful and proactive CEO. That’s my take on a common issue which is rarely discussed out loud. Have you had your own issues in this area? Post a comment below to add to this discussion. You said in your post that no one could be good at both sides. Case in point, I should be. But when I’m in the product marketing role, my advocacy for the customer blinds my ability to see just how hard some things are to implement. As a developer, I really want to work on the interesting stuff (I want stimulating work) and so I want to get the easy stuff out of the way quickly. As a developer I can get annoyed by requirements that are not well speced out that waste my time and have to be reimplemented later. This attitude prevails even though I talk to customers on a regular basis, it is just seems to be the mindset that comes with the job. There can’t be a healthy respect between the organizations if the product managers are not technical. I generally recommend hiring product managers out of the systems engineering ranks – those who have a great respect for the customer, good communication skills, and a healthy technical bent. Product marketing skills can be taught. Obtaining the respect of the development organization can’t be taught or bought. The most successful development/marketing team I ever witnessed was when I was a CEO and the VP of development was married to the director of product marketing. Lots of companies have policies against this, but for me, it was a match made in heaven. Thanks for a really great post!